CG Says: The 2019 Toyota Prius c reduces and renames its model range. The previous One through Four trim levels are replaced by L and LE trims that roughly replace Two and Three. Features such as heated seats, power sunroof, and 16-inch wheels are no longer available. Prius c is Toyota’s smallest hybrid. The subcompact four-door hatchback has seating for five. A 1.5-liter four-cylinder engine paired with an electric motor produce a combined 99 horsepower. A CVT automatic is the only transmission. Standard safety features include: pre-collision system with pedestrian detection; automatic high beams; lane-departure warning with steering assist; and adaptive cruise control. 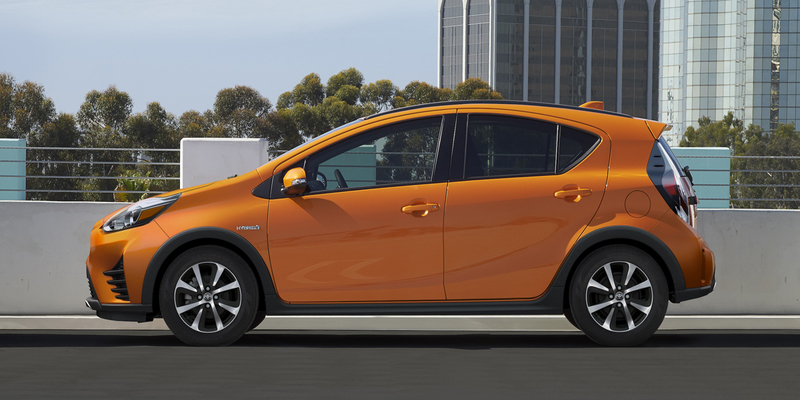 The Prius c might be short on acceleration and quietness, but it’s big on fuel economy. Very big, actually, as it recorded some of the highest fuel economy numbers we’ve ever seen. Toss in decent versatility, passenger room, and a price tag that rivals many non-hybrid small cars, and you have an ideal choice for those who place a high value on frugality in all forms.